Freddy Fuego offers up a well-constructed burrito with tasty and high quality-ingredients. Service is friendly and efficient. Dining in is comfortable, with beers available, or you can take away and save a little cash. 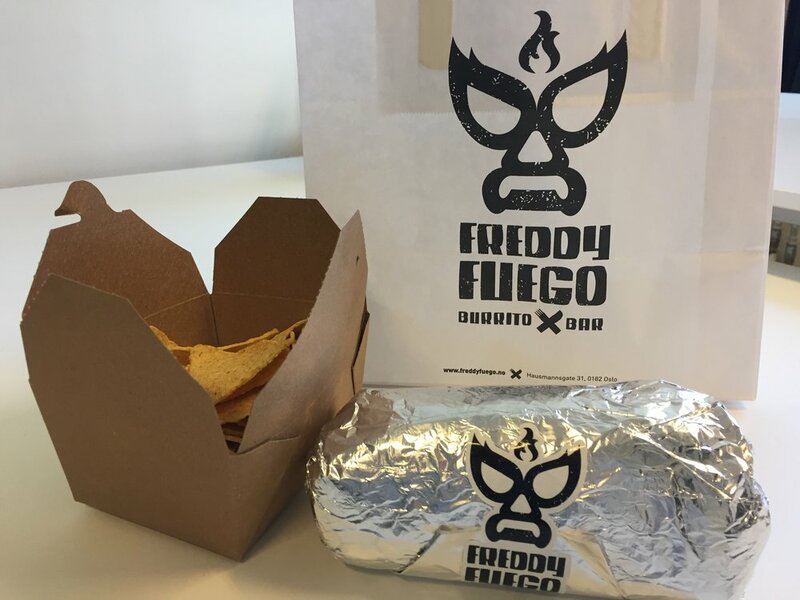 Freddy Fuego call themselves a burrito bar and that’s exactly what they are. Nothing more, nothing less. I’m a big fan of a straight-forward concept and menu. I make enough decisions in a day that when it comes to buying lunch it’s nice to keep it simple. It seems that more budget-friendly places in Oslo are beginning to take this approach. We are seeing smaller places with more focused menus (just take a look at Vippa), which I think is great for Oslo’s food culture. It definitely makes for a nice change in comparison to the please-everyone-but-not-really-anyone “Asian” restaurants. But enough of my ranting, this is all about a humble burrito. The meat selection is between “tender beef”, “succulent pork”, and “juicy chicken” with a roasted sweet potato vegetarian option as well. On top of that, rice, beans, roasted peppers and onions, cheese, and sour cream are all included. Then there are four salsas to choose between, from pico de gallo through to the three-flame rated freddy’s revenge. Guacamole is extra. I went for pork with all the free fillings, plus the single-flame salsa verde (110 NOK). At the last minute I also threw in some tortilla chips (25 NOK) to help me push through the afternoon. As they were making the burrito I could tell there’s no mystery ingredients involved here. A guy in the back was scooping out avocados. Everything looked tasty and I wanted to eat it all. They made my burrito at the same time as another customer’s, which the other customer seemed to find weird, but I’m giving points for expediency. Overall the service was like most service in Norway: giving you exactly what you asked for and nothing more. The pork was indeed succulent. It was juicy, tender, and tasty without blowing my mind. The rest of the fillings tasted fresh and provided a nice balance. The salsa verde lived up to the hype and didn’t have any real spice but did carry a nice zing. I’d probably ask for a little more next time to jazz it up. I love my sour cream (a couple of years in Hungary will do that to you) and it took quite a few bites for me to reach it. Other than that though, I found the burrito pretty well constructed and importantly, it never got too soggy. Provided you’re not burrito-challenged you won't find some kind of sour cream/meat juice/salsa liquid dribbling down your arm halfway through one of these burritos. The tortilla chips were good and a large portion. There is definitely enough to go around if you want to share. They weren’t super salty which was nice. I was being tight so I didn’t spring for a salsa (20 NOK, salsa & gaucamole 40 NOK), but I would next time. I like that they have burrito boxes for the no-glutenites and manage to keep all of the fillings gluten free. It’s a good indicator that everything is made from scratch and not pumped up with random pre-made stuff. As is usually the case, it costs a little extra to eat-in and each burrito becomes 10 NOK more expensive. The place itself is relatively small, and seating is cosy without being cramped. It might be tough to find a seat at a busy time of night. There are no small tables, it's large picnic style benches and bar seating along the window. It means that you might have to sit next to a stranger. Locals – you've been warned. A nice selection of imported beers and sodas means Freddy Fuego can make a nice start to an afterwork drink session or a night on the town. It’s always good to have a decent feed before getting stuck into the booze and this isn't the kind of burrito you'll regret at the bar later in the night. And if you're not super hungry, I've always loved the fact that if you can't finish a burrito, you can just wrap it back up and stick it in your pocket for later.